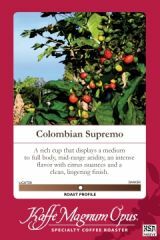 Colombian Supremo Coffee: Supremo refers to the size of the bean in this high quality Colombian Arabica coffee. The large, beautiful beans yield a rich cup displaying a medium to full body and mid-range acidity. 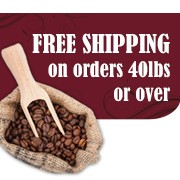 Our Supremo bean delivers a balanced coffee with an intense rich flavor, citrus nuances and a clean, lingering finish. This is by far our most popular Single Origin coffee.